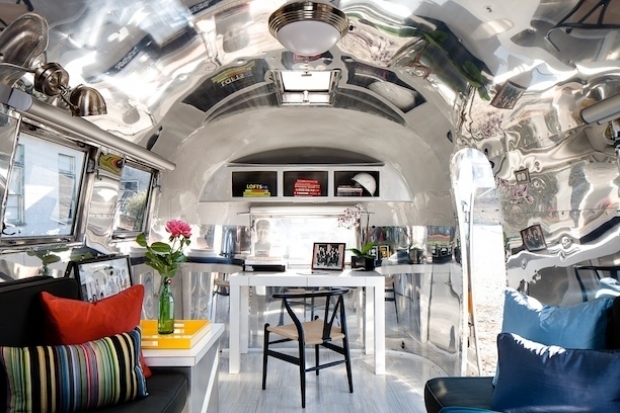 If you have ever been inside an Airstream trailer, you know they are built to last forever. The vintage models were finished in the finest paneling and furniture. However, they were also small and in the words of a former owner I know "very chopped up". I have always wondered what that space would be like if all the walls were removed. Now I know. I am drawn to small spaces and I suppose I could live in my bedroom if the amenities were there. Give me a very small kitchen, a desk, a bath, a bed and I am happy. All that is remaining of this vintage Airstream is the shell. All of those amenities are gone. 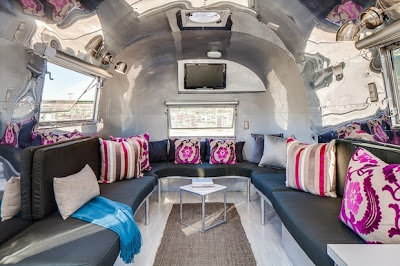 The interior has been gutted, lined with shiny walls and retro fitted with a desk, a flat screen TV and a lounge. I don't think I could live in this. But boy could I work. I love this things. Huffington Post shared these images via their Huff Post Home page. Trendy, mobile and logical...a foodcart-style real estate office may be in your neighborhood today. It's all yours San Francisco! If you live in a small space and want some ideas, just do a search using "small space interiors" in the google search. It is almost like being a peeping-tom but not illegal. I like that part. Here are a couple I found on a website called 1KindDesign. They featured 40 images that I think you would love.. I love them all! I've seen refurbished train containers that would work also.